While entrepreneurship is widely cited as playing a key role in economic development, job creation, and advances in well-being in capitalist nations, there has been an overwhelming focus on the firm, firm founders, and founders’ strategies and decision-making processes. Only more recently, the important link between communities and entrepreneurs has emerged as a new frontier in entrepreneurship research. This book brings the emerging nexus between community and entrepreneur to light by exploring the mutual impact that communities and entrepreneurs have on one another. It focuses on how entrepreneurship development can push beyond the traditional emphasis on economic growth: from enriching the local lifestyle to building self-sufficiency; from attracting new markets to rediscovering traditional work; from the highest tech enterprises to the most ancient crafts and trades. 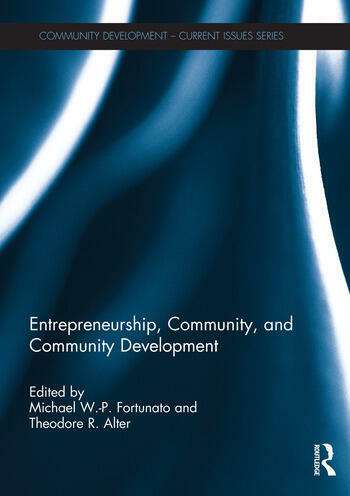 The authors cover a wide variety of topics including rural community entrepreneurship development and culture, innovation and regional development, community-based enterprise learning, and urban revitalization strategies. This book was originally published as a special issue of the journal Community Development. Michael W-P Fortunato is a founding partner of Creative Insight Community Development (CICD), co-founder of North Bay Music Foundry (California, USA), an instructor in Community and Economic Development at Penn State University (Pennsylvania, USA), and former Assistant Professor of Sociology, Engaged Scholar, and Director of the Center for Rural Studies at Sam Houston State University, USA. His professional interests include finding ways to infuse community development practice with high levels of creativity, enthusiasm, and compassion. His research focuses on how local culture and institutional structure shape local innovation, entrepreneurship, and well-being in communities both domestically and internationally; and how to enable transformation from legacy social systems into newer, flexible, more democratic and entrepreneurial local systems that serve the public good. Theodore R. Alter is Professor of Agricultural, Environmental and Regional Economics, and Co-Director of the Center for Economic and Community Development, at Pennsylvania State University, USA. He also serves as an Adjunct Research Fellow in the School of Law at the University of New England in Australia. His research and teaching focus on community and rural development, resource and environmental economics, public sector economics and policy, institutional and behavioral economics, and public scholarship and civic engagement in higher education.